Ferguson Case Orr Paterson was honored to host a gathering of Pepperdine Law alumni last night in celebration of the law school’s new dean, Paul Caron. Judge Bruce Young regaled us with stories from his days at Pepperdine’s Anaheim campus, from a mysterious classroom fire around finals time to nightly fireworks shows courtesy of Disneyland. 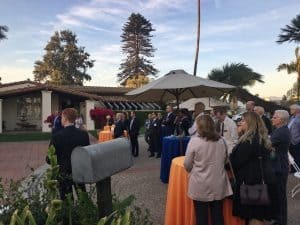 Vice Dean Jim Gash shared memories of previous deans and insights about the history of leadership at Pepperdine, while Dean Caron capped off the evening with a discussion of the current state of the law school and his vision for its future. Many thanks to all who came out to celebrate with us, and to our own Pepperdine alumni – Joe Strohman ’82, Jesse Cahill ’02, and Bret Anderson ’05 – for helping to coordinate this event.